If you haven’t done so already, go buy yourself an ESP8266-based board. It is a powerful little microcontroller. Something like Arduino but with WiFi. Powerful 3.3V power source (providing about 1 or 2 A). I used a USB power adapter (5V) with a step-down voltage regulator. Contains all the tools needed for compiling your own ESP firmware. This converts the ESP to a LUA-powered computer. RX to TX and TX to RX (ESP–UART). 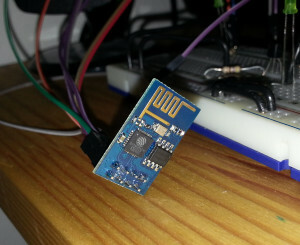 Leave Reset floating, connect to GND to reset the chip when needed. Pull the GPIO0 low for flashing. If you just want to get the ESP fired up, use the esptool.py and upload the precompiled NodeMCU bin images. If you want to play around some more, get the SDK and NodeMCU source code. Compile the former and then the latter. Flash our own bin images. Remove GPIO0 connection to leave the flashing mode. Open the ESPlorer and issue some commands to the chip! Forked from the original NodeMCU firmware repository. Contains a new Sniffer module — packet sniffing functions exposed to the LUA interpreter. This allows WiFi packet sniffing using the ESP8266. List of provided LUA functions in the NodeMCU firmware. Beware that not everything is supported in the ESP version of LUA.